Today Kathi, Chris, and I went to Chaparral park in Scottsdale. We got there around 8:00. We were trying for Trout but not having any luck. We even tried for leftover catfish, and bluegill. Around 10:45 I decided to go walk about. I started walking south around the park. I got about 100 or 200 feet from where Kathi, and Chris were and I cast my line with an old beat up rattle trap on it. In one area on my second cast I thought I had snagged my line. I saw a large bass on it, but it got away. 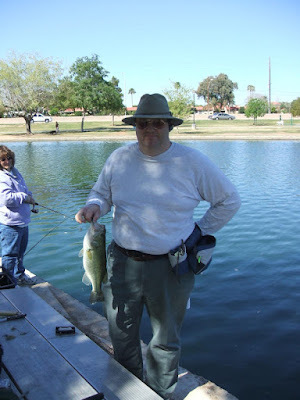 I decided to cast again in exactly the same spot and caught the 3 pound bass below.